This image of Punch should demonstrate that the spirit of Punch continues to evolve. It is not intended to offend anyone. Your reactions are welcome. Derek Rigg's Punch was sent to us by Tony Piller, an avid Punch fan who also happens to be a dedicated heavy metal fan. 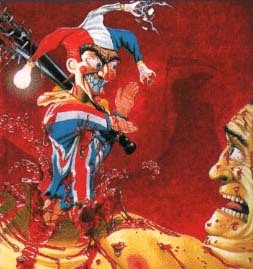 According to Tony, the image above is by the illustrator Derek Riggs from the cover of a CD by Bruce Dickinson. Tony also mentioned that Bruce Dickinson travels with a "Punch mascot" that was stolen during a European tour last summer. A reward has been offered.